Needles – hollow needles used to inject medication under the skin. Syringes – with attached needles. Syringes are used to inject medication into or withdraw fluid from the body. Lancets – short, two-edged blades used to get drops of blood for testing. Lancets are also called fingerstick devices. They are commonly used in diabetes treatment. 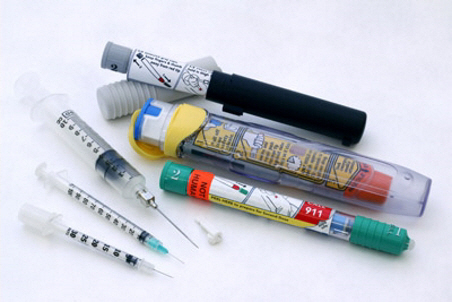 Auto-injectors – pre-filled syringes with attached needles. Auto-injectors are used to self-inject medication like insulin. Always place loose needles and other sharps into approved sharps containers. Never flush them down the toilet. Don't place them in household or public rubbish bins or recycling bins. Used needles and other sharps are dangerous if they aren't disposed of safely. They can injure people and spread infections that cause serious health conditions. The most common infections that can be spread by used sharps are hepatitis B, hepatitis C and human immunodeficiency virus (HIV). It is important to always dispose of sharps safely. Use suitable containers wherever you are. This includes home, work, school and travelling (including public places such as hotels, parks and restaurants). You can take safely packaged used sharps to your local pharmacy for disposal. What packaging is appropriate may differ from pharmacy to pharmacy. When you get your medication from your pharmacy, talk to a member of staff about how to bring your used sharps back. They may accept your sharps in a suitable household container (they’ll tell you which ones are safe to use) or they may sell you a yellow or purple sharps container. Written by South Canterbury DHB Primary and Community Services. Adapted by HealthInfo clinical advisers. Last reviewed February 2019.